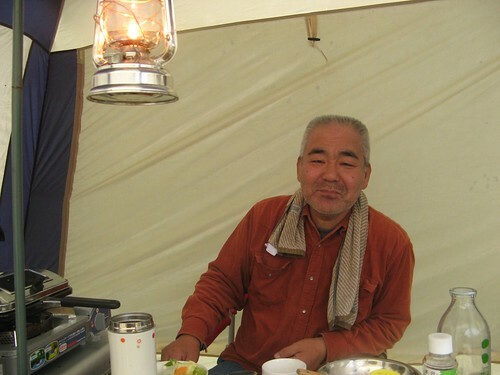 The day started, that is the daylight part of today, hours before that I’d woken to see clouds rolling over the hills in darkness, with a hearty breakfast courtesy of Barabara’s campsite neighbour Sato-san (not to be confused with the Sato-san I met at Takochi-dake Onsen). A light salad, chunky vegetables in a thick sauce and slightly browned toast. All very different to the Snickers and SoyJoy bars I’ve been giving myself for a while. Barabara and I set off along the riverside path that wasn’t on my map but he seemed to know it well. I appreciated the local knowledge until I realised I was being eaten by mosquitoes and we’d done 3km to miss 2km of road. Sometimes we walked together, trying to make conversation, but mostly it was single file a dozen or more metres apart. He stopped to get photos of every distance sign from Asahikawa, I settled for those counting down to Wakkanai and one pointing to ‘Seishonenshukuhakushisetsu’. After one long gap I let him catch up and said I’d take a break at the town 2km away. Red-faced and sweating he said that was fine, that I was young and strong and he bravely battled on. But while I stuffed myself with cream-filled buns, pineapple juice and chocolate sandwiches he announced we’d have to part ways here. My pace was just too much he said. I offered to slow down but luckily he refused. Right now a railway sleeper in my bag wouldn’t slow me down. 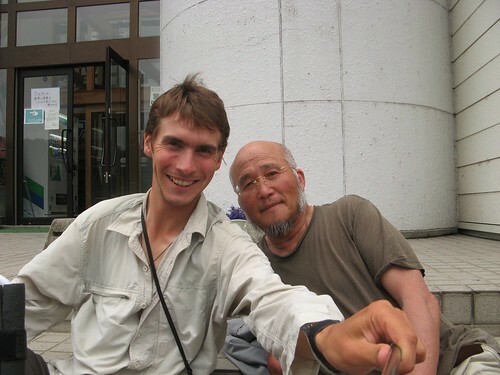 It’d hurt like crazy but I’m less than 100km from Wakkanai and the bus terminal where I’ll see Tania again. So I took the road west into the gorge alone. Barabara had revealed himself to be a religious man. With beads on his wrist he said there was someone, and I must confess to not catching who, with him when he walked. I’m lucky enough to have Douglas Adams with me and thanks to Richard I’m also carrying Bill Bryson. Those of you also reading FourCornersOfJapan.net will know by now that Chris just lost his iPod. A terrible thing, and on his birthday too! For a while I was carried away to Iowa in the 1960s. And when I snapped out of it an hour later my jacket was stuffed behind me, my sleeves rolled up. I was wearing my hat and sunglasses. The gorge was starting to open up and for the first time in 8 days there was a good proportion of blue sky above. Also my internal monologue had taken on a subtle American accent and I wanted to talk about things in hugely exaggerated terms, like groups of 4,000 children or roller coasters 12,000ft high. I reached the road station with minutes to spare before closing. Unfortunately I spent those minutes in the toilet and emerged to find it all closed down. The ice-creams depressingly out of reach for the night. Craig, I must have told you 1000 times by now that Americans don’t exaggerate! He was walking with Kobo-Daishi who was a Japanese monk, scholar, poet, and artist, founder of the Shingon or “True Word” school of Buddhism. I know this because I walked the 88 temple pilgrimage and that’s who walked with me the whole way.